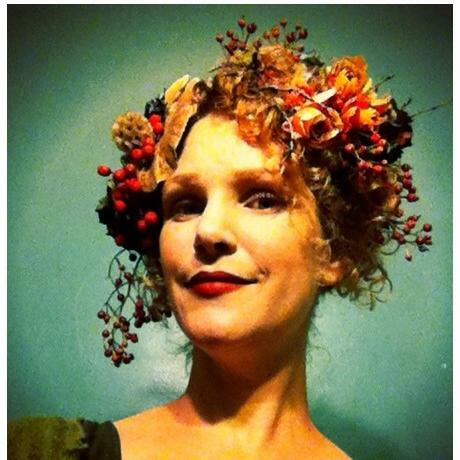 Love this portrait of Melissa, the crown of her head encircled with flowers. This week’s guest is my very good friend and “flower-sister” Melissa Feveyear, owner and creative director of Terra Bella Flowers. 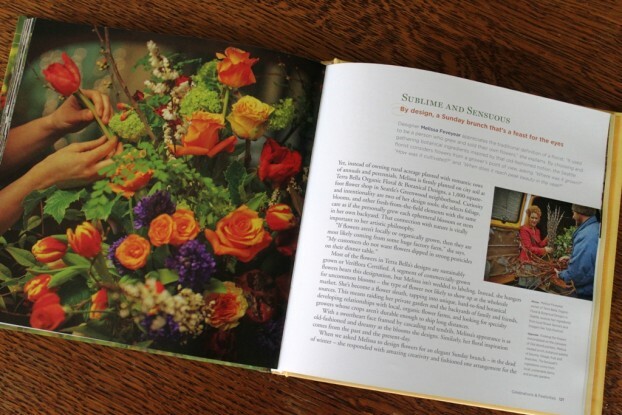 Melissa’s appearance on the Slow Flowers Podcast is especially exciting this week because she and her work will be showcased at the next Field to Vase Dinner, set for Saturday, September 12th at Jello Mold Farm in Mt. Vernon, just north of Seattle. Only 10 designers in the country have been invited to create the floral installation for the Field to Vase Dinner series, a very special pop-up, floral-centric dining experience pairing local flowers and local food. 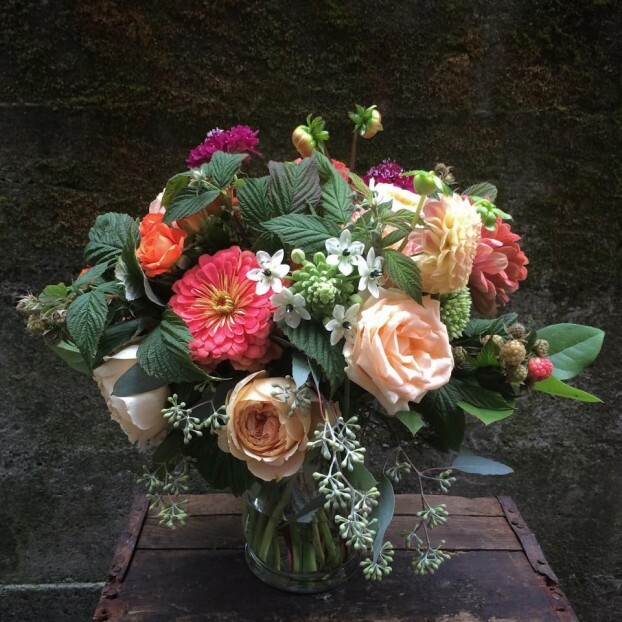 It is fitting that Melissa is the featured designer this week because she is a longtime customer of Jello Mold Farm and the entire floral community of the Seattle Wholesale Growers Market. 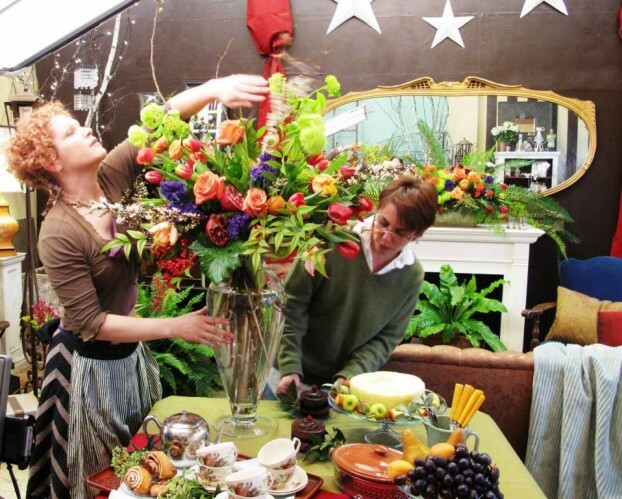 You’ll hear us discuss her role in the Market’s origins as the first cooperative marketplace connecting local flower farmers with local florists. Melissa, left, on location in her Seattle shop during our stylized photo shoot for The 50 Mile Bouquet. My talented friend Jean Zaputil, right, was our stylist. Terra Bella is located in Seattle’s Phinney Neighborhood on a busy pedestrian corner. The visionary of Terra Bella Flowers, Melissa combines her obsession with all things rooting and a background in Environmental Studies/Hazardous Waste Management. After working in the field and becoming aware of the amount of pesticides used in the production of cut flowers, she realized she couldn’t consciously support the conventional side of the floral industry. 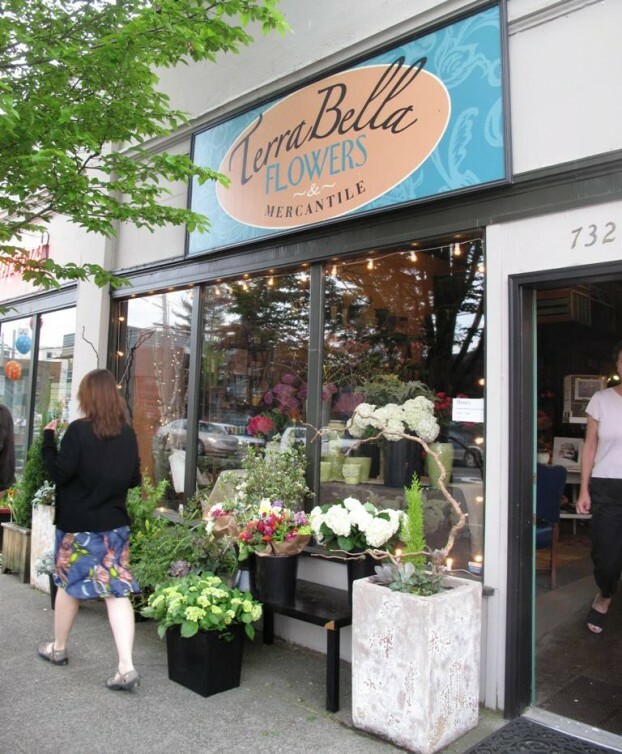 Melissa created Terra Bella Flowers nearly 10 years ago to prove that the business of flowers can be a beautiful thing, from the time the seed is planted, until her bouquet arrive at your door. Curiosity and intentionality are two of her design tools; she selects foliage, blooms, and other fresh-from-the-field elements with the same care as if she personally grew each ephemeral blossom or stem in her own backyard. That connection with nature is vitally important to her artistic philosophy. Melissa has been a fabulous supporter of Slowflowers.com from the moment it was just an idea of mine. She has contributed her time and talents, appearing on the 2014 Indiegogo campaign video that helped raise more than $18,000 to launch the online directory (see above). We’ve also teamed up to promote Slow Flowers on local television and at special events — and I know you’ll find Melissa and her story inspiring. Another lovely seasonal floral arrangement from Terra Bella Flowers. A lush, seasonal summer bouquet from Terra Bella Flowers. 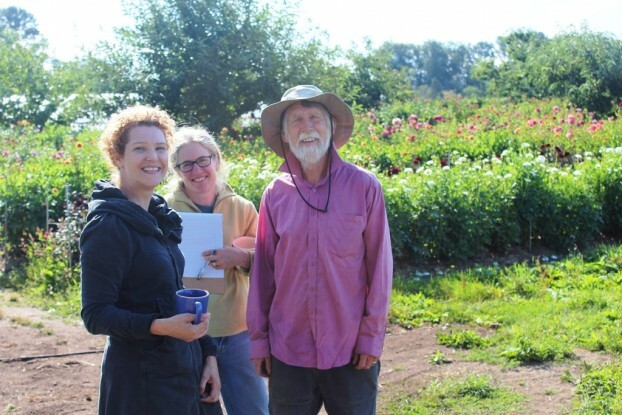 In August, Melissa and I did a pre-F2V Dinner walk-through of Jello Mold Farm with flower farmers Diane Szukovathy and Dennis Westphall – don’t they all look happy in the flower fields? Thanks for joining me today. 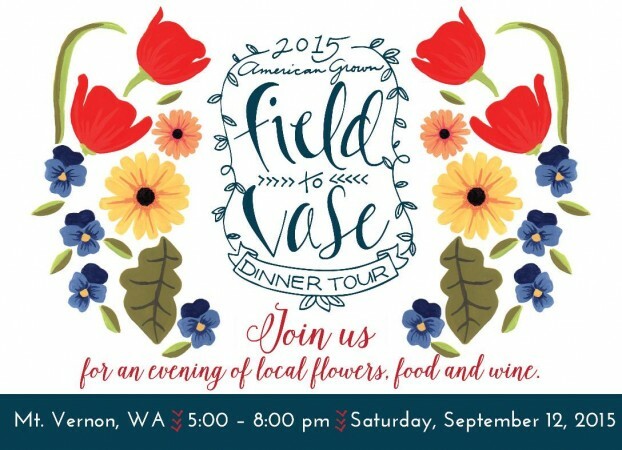 If you’re in the Northwest and you want to experience the magic of Melissa’s Northwest Gothic floral installation at the September 12th Field to Vase Dinner, there’s still time. A few tickets are still available and I can’t wait for you to be part of the evening on a flower farm. Follow the link to reserve your seat at the table and use the special discount code SLOWFLOWERS to enjoy a $35 discount when purchasing your ticket. Episodes of the Slow Flowers Podcast have been downloaded more than 63,000 times and I thank the progressive floral community for supporting this endeavor. It is nothing short of inspiring to see the listenership increase each week – and we have received only 5-star reviews on iTunes, 22 in all. 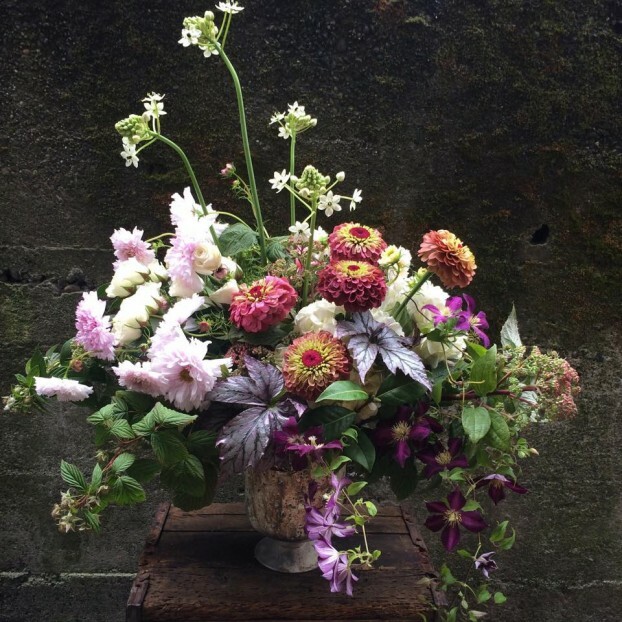 This entry was posted on Wednesday, September 9th, 2015 at 9:38 am	and is filed under American Grown, Blog Posts, Creativity, Entertainment, floral design, Flower Farming, General, Podcast Episodes, SLOW FLOWERS Podcast, Slowflowers.com the Directory of American Flowers. You can follow any responses to this entry through the RSS 2.0 feed. You can leave a response, or trackback from your own site.